Whenever photographing details of an Orillia wedding day, I look around the room for items that have been brought specifically for the wedding. In this case, I was ready to photograph the rings, but needed something to set them on. The table itself was boring, with little texture or colour. 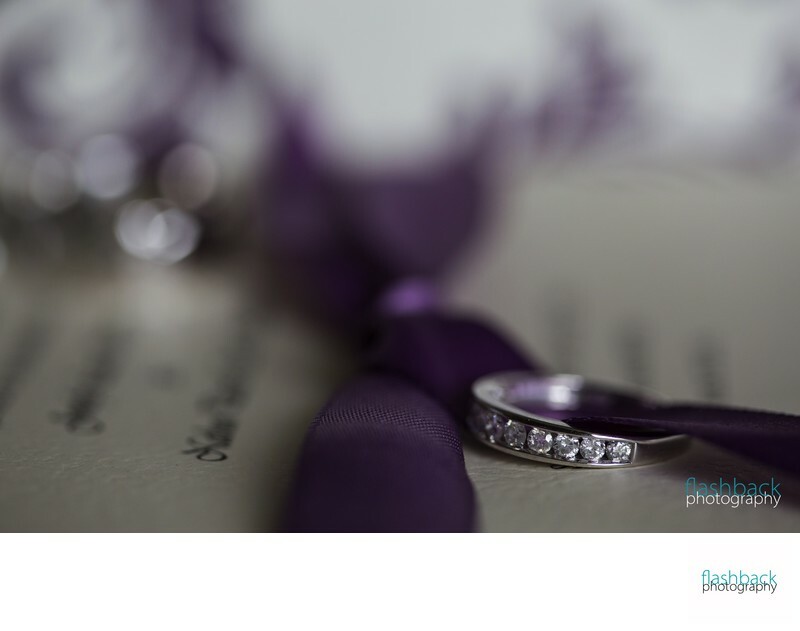 I saw the wedding invitation on a nightstand and knew that, while the text may not be legible in the photograph, the purple ribbon would bring the colour of the wedding theme into this otherwise quite simple Orillia wedding photograph. I also was drawn to the texture in the paper, which was an eggshell finish. The texture on the wedding ring was complimented nicely in this way. As an Orillia wedding photography specialist, I enjoy merging multiple wedding details into one image.